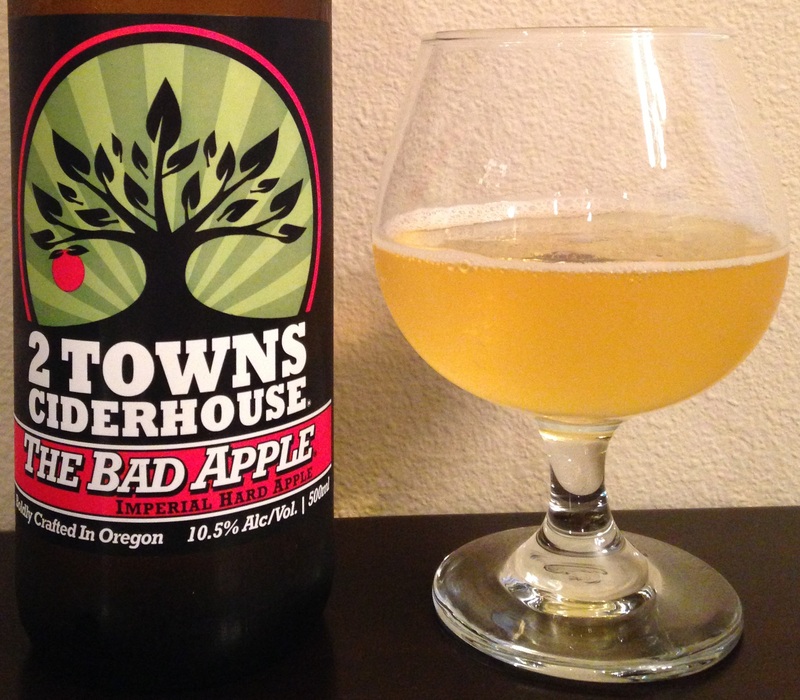 Review of The Bad Apple from 2 Towns. I’ve had this cider before, and many other 2 Towns varieties. Isn’t their bottle styling awesome? Really eye-catching. Cider Description: Big & bold, The Bad Apple is an imperial style cider, fermented with local meadowfoam honey and aged on Oregon White Oak. 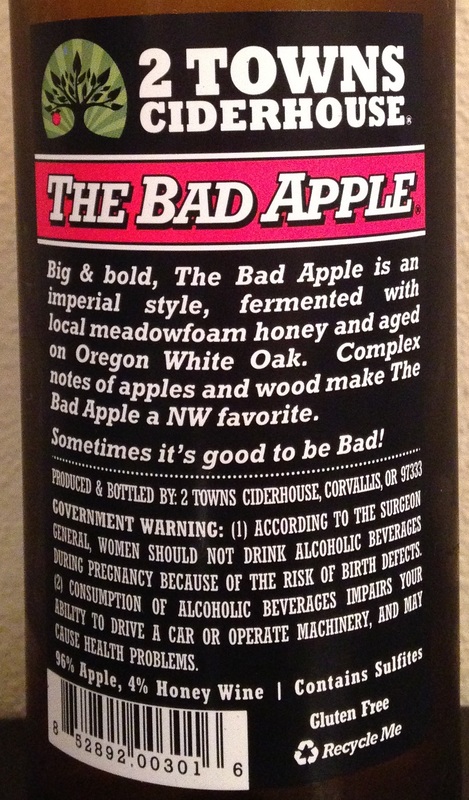 Complex notes of apples and wood make the Bad Apple a NW favorite. Sometimes…it’s good to be Bad! How Found: Initially, browsing. I’ve had this cider at least once before and was in the mood to have another bottle. First Impression: Yellow/orange tinted straw gold hue. Moderate carbonation upon pouring with a light foam ring and tiny bubbles. Smells like rich apples, honey, booze (whisky? ), yeast, and oak. Opinion: Semi-dry. Quite apple-forward, with rich apple, honey, vanilla, and oak notes. The perceived barrel influence remains mild. Moderate acidity and tartness. I almost pick up some citrus with the tartness. Mild bitterness and astringency. No sourness or funk. Medium bodied. Low to moderate carbonation. Longer finish with lingering tartness and acidity. Well-hidden ABV, which mostly presents as warmth. Complex but simple at the same time. I enjoyed this fridge cold, which surprised me as usually with this style of cider I like it closer to room temperature than fridge temperature…when it warmed up the tartness seemed more present. Most Similar to: This kinda reminds me of Moonlight Meadery ‘How Do You Like Them Little Apples’ cider for some reason…probably as that one tasted like it was higher ABV (but wasn’t), and had honey and oak notes (but it was sweeter and more full bodied). By the way, I find this cider very different from the other 2 Towns Imperial-Style cider I’ve tried, Serious Scrump, which is an 11% ABV English-Style cider available seasonally, which I found to be quite dry and bitter and not to my liking. Closing Notes: Awesome! This is actually my favorite cider from their regular line so far (and I’ve tried at least 10 ciders from 2 Towns). I think its a great value. 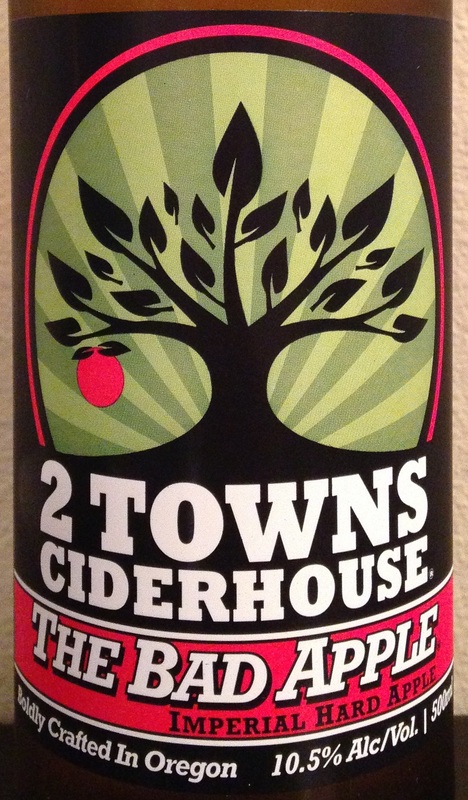 I also think 2 Towns is a really cool cidery in general…really down to earth and fun-loving. Their tag line is “Damn Fine Cider” lol. I hope to visit them someday in Corvallis OR. I’ve actually met co-founder Aaron Sarnroff-Wood (at Cider Summit Seattle 2015 and a Schilling Cider House 2 Towns tasting event) and communicated with him by e-mail about their Cider Master Reserve Batch No 01, and he is super helpful. I highly recommend this cider if you enjoy higher-ABV ciders and want something unique. Have you tried any ciders from 2 Towns? What did you think?